I belong to the Instant Pot community’s Facebook group. I found it to be extremely helpful in finding real world, easy recipes that I can cook and feed my family without ripping my hair out. The best part about it is that people share details on how they adapt their recipes and create some yummy stuff. Many recipes are just a paragraph long, which is awesome. The worst part about Facebook is trying to find the post again. It now has a save post feature, but it’s still a hassle. 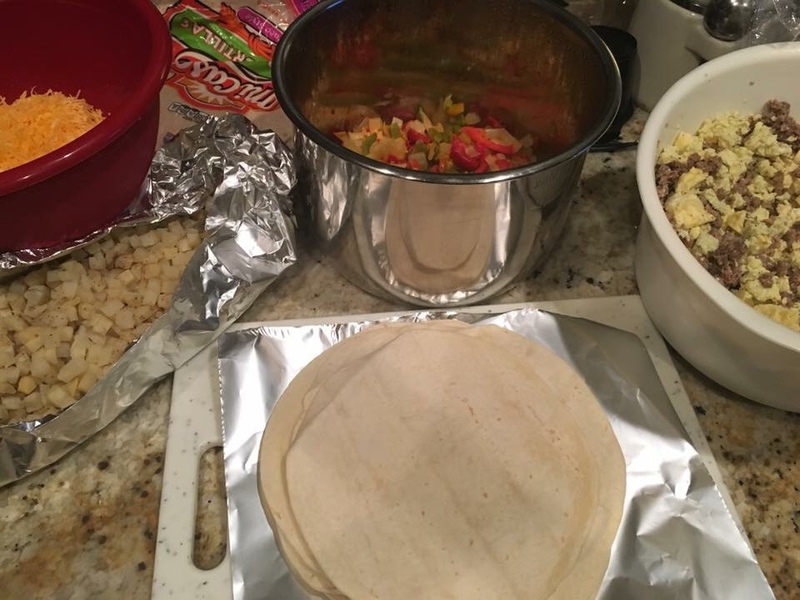 I recently came across a post where a woman named Tracey was sharing how she had created over 30 breakfast burritos. I’m married to a man who loves Mexican, and I’m not a morning person. This seemed like a godsend. So I found followed her directions and assembled my own 20+ breakfast burritos. In the morning, I was looking at an extremely happy man. And I was happy because I wasn’t rushing around trying to create some food to feed these people. It didn’t take long before my initial batch of breakfast burritos were gone. So I made another batch. I decided to copy and paste all the instructions so the next time will be easier. Here’s the recipe for homemade IP breakfast burritos in bulk from Tracey (in her words with my 2 cents). The original recipe is not spicy. However, my man loves hot and spicy. So I added some awesome habanero cheese that I got at Costco and hot spicy breakfast sausage. I wish I could remember what brand of sausage I had the first time I made them, because it was really spicy, but I’ll just have to keep trying until I figure out which sausage is the spiciest. Spray the liner with cooking spray. Pour in egg mixture. Manual, low pressure for 12 minutes. QR then stir making sure to get across the bottom. Then put on for a second 10 minutes manual, low pressure, QR. Then cook out any leftover liquid on sauté if needed. Place 2 lbs breakfast sausage (frozen) side by side on trivet with 1 cup of water below. Set for 30 minutes, manual, NPR. The sausage stays whole & funky looking but after removal; just break apart with a fork, and it crumbles up fine. We like sausage so I made all my burritos with the sausage & egg base. Therefore, I mixed in the crumbled sausage with the egg. I placed this mixture in fridge overnight. I should add that if you slice in & there’s still pink, score both 4 times to allow more access of the steam. Set 5 minutes then QR. Repeat as necessary then write down how long it took. Mine were cooked in 30 but I’ve seen others for sausage containing recipes take 40-45. I used 6 qt. IP for mine. I totally cheated! I bought a bag of pictsweet peppers and onions from the frozen section. I saluted them with some grape seed oil and let them cool to room temp. Sonia’s comments: I have used both fresh peppers and fresh potatoes with this with good results. However I like Tracie’s idea of buying the pre-bought frozen peppers, so I’ve done that for next time. I also think you could add vegetables like spinach or asparagus, but haven’t tried yet. You can use foil or parchment paper. I’ve done both. If you use foil, the pre-cut foil sheets from Cosco work great. However you can’t microwave it. That’s why I chose to use parchment paper the second time I made the burritos. Whatever you use, prep by tearing off pieces that are about the size of the tortilla. Place foil under tortilla and build starting with cheese first (keeps tortilla from getting soggy from egg), then I did potatoes next, eggs & sausage mixture, then peppers. I watched a few YouTube videos to become an expert on folding burritos, and it was very helpful. Tips: I like the taco size flour tortillas for this. Fajita is too small & burrito is too big. I wanted a true to size breakfast burrito that could be easily held to dip into salsa. 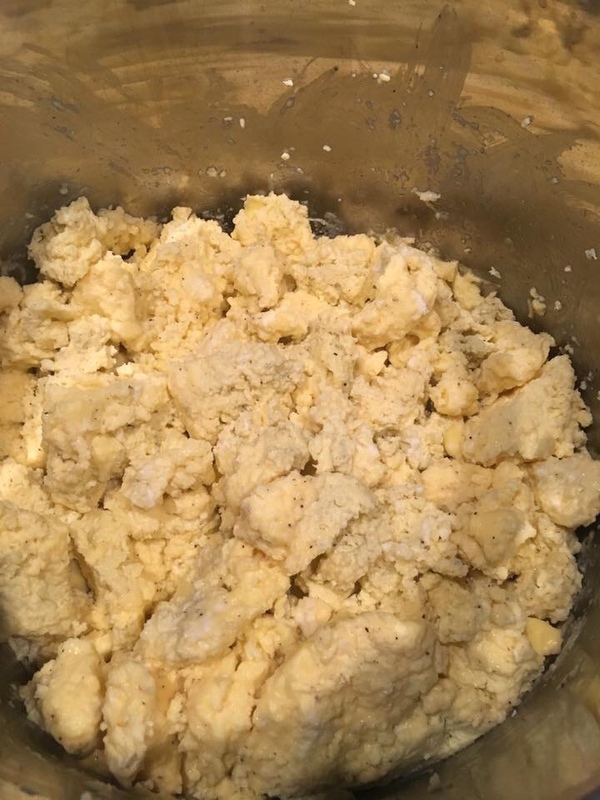 For cheese, I normally shred my own to avoid the preservatives but in this case with freezing, the preservative actually helps the cheese from clunking up and heats up with less moisture. If you used foil, carefully remove from foil so you can re-wrap if you’re taking them or eating them on the go. If you use parchment paper, just leave it alone when you microwave it. Loosely wrap in paper towel and microwave approximately 90 seconds. If you have less ingredients (mine are thick) you could check it after 60 seconds & see. Also if you take them to go & microwave after slight thaw, 60 seconds does it. Again, these are my microwaves & my altitude so you’re going need to experiment. I have not done this yet, but Heather who originally posted said they’re good reheated in toaster oven for about 10 minutes. Makes a crunchier tortilla which might be nice, plus you can leave in the foil to heat. Dip these babies in salsa or open up and slather salsa inside then roll back up. Others put them single layer on a sheet pan in freezer, but I skipped that step and put mine directly in freezer bags. For anyone wanting to reduce eggs or wanting to cook a different way, there are PIP methods for the eggs. Search this group for scrambled eggs. I just adapted the big recipe from someone else & it has worked for me. It did make a brown “crust” of egg on the bottom of the pan which I discarded but mine never burnt. I’m generous with the cooking spray too. You could just cook the eggs on sauté in the pot or pressure cook on low pressure for 5-6 minutes then sauté to finish. Lots of ways to adapt this to a smaller recipe.